Dez Bryant has distinguished himself as a talented wide receiver with great athletic abilities. In addition to his ideal size and speed, Dez has great agility and ball-catching skills which have made him stand out in the National Football League. He began his NFL career in 2010 when he signed up with the Dallas Cowboys and completed eight successful seasons with the Cowboys before joining the New Orleans Saints in 2018. Interestingly, Dez has been named to the Pro Bowl three times since the inception of his career. He also got All-Pro first-team honours in 2014 after emerging as the league’s touchdown leader. Learn more about Dez Bryant below. NFL wide receiver Desmond Bryant came into this world on the 4th day of November 1988 and his birth took place in Galveston County, Texas. His parents MacArthur Hatton and Angela Bryant are black Americans. Although Dez hasn’t shared much information regarding his childhood; it is already known that he grew up in Texas, United States. Dez started playing football during his high school days and he went to Lufkin High School. In addition to football, he was also a track and field athlete for his school. When he completed his amateur career, the wide receiver got a four-star rating by sporting websites and chose to attend Oklahoma State University for his collegiate career. Using an athletic scholarship, Dez Bryant enrolled in Oklahoma State in 2007 and was able to combine his football career with his academics. In his freshman year, the star made six touchdowns and 43 receptions for his team. He also helped his team to win the 2007 Insight Bowl while defeating Indiana Hoosiers. As a sophomore, he recorded new career highs of 19 touchdowns, 87 receptions with 1,480 yards. In his junior year, Dez was banned after three games for violating the NCAA rules. He made four touchdowns, 17 receptions, and 323 yards. He had to forgo the last season of his college eligibility so he could join the 2010 NFL Draft. The wide receiver was chosen by the Dallas Cowboys as the 24th overall selection in the NFL draft of 2010. He penned a five-year rookie contract worth $12.05 million in July 2010. Joining the Cowboys, Dez played his first professional game for the Cowboys in September 2010 and by the end of his first season, he hauled a total of six touchdowns, 45 receptions, and 561 yards. As a result of his impressive performance, Dez was selected to the NFL All-Rookie Team. The next season, he made Cowboy’s starting squad following the departure of veteran Roy Williams. Dez made nine touchdown, 63 receptions, and 928 yards at the end of the 2011 season. The wide receiver suffered a series of injuries in 2012 as he worked really hard to create a new career high of 1,382 receiving yards. He also had 12 touchdowns and 92 receptions in the same season. The following year, Dez registered his name on the Pro Bowl squad as he was picked to feature in Bowl after making 13 touchdowns and 93 receptions with 1,233 yards. Dez Bryant made a significant improvement in his game in 2014; thus, finishing the season with 16 touchdowns, 88 receptions, and 1,320 yards. His touchdowns became the highest in the league and he equally got his second Pro Bowl selection that year. He penned down a five-year contract extension worth $70 million in 2015. The contract includes a $20 million signing bonus and $45 million guaranteed sum. During the 2015 season, Dez made nine appearances for the Cowboys. He underwent foot and ankle surgery in the second quarter of the season and it took him up to six weeks to fully recover and return to action. The player’s performance began to reduce in 2016, he finished with eight touchdowns, 50 receptions. He was laid off by the Cowboys in April 2018 after completing eight seasons with the team. 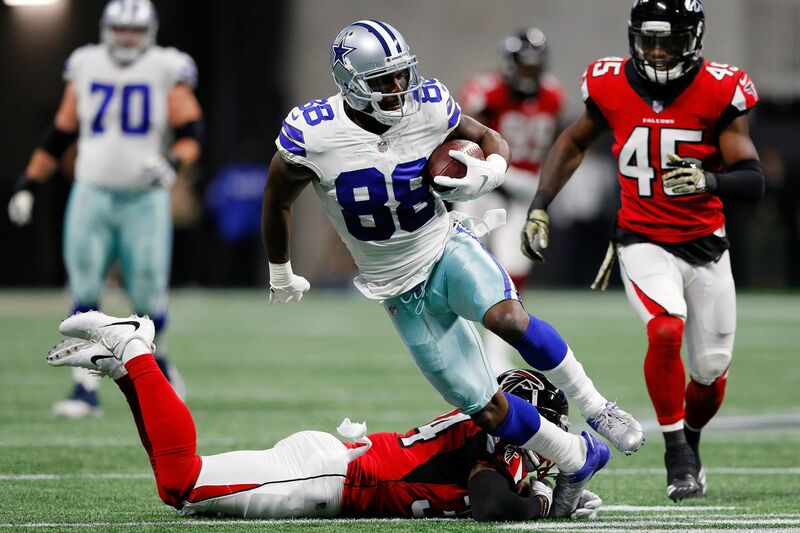 Dez was then recruited by the New Orleans Saints who signed him up to a one-year contract at $1.25 million in November 2018. Joining the team, Dez suffered an Achilles injury during practice. The injury which was confirmed via an MRI scan kept Bryant away for the whole of the 2018 season. The talented wide receiver has really experienced various twists and turns; nevertheless, Dez has remained focused in his career. He has made huge wealth from his football career as well as endorsements and other business endeavours. That said, Dez Bryant currently has a whopping net worth of $32 million and receives a salary of $1.25 million annually. Also, Dez has signed promotional deals with notable brands such as Nike and BodyArmor, among others.